I had no idea about the release of this new dry shampoo until it arrived at my doorstep. Of course I was excited, because although I love my Batiste, it does have its flaws. We are always trying to find something better than what we have, right? 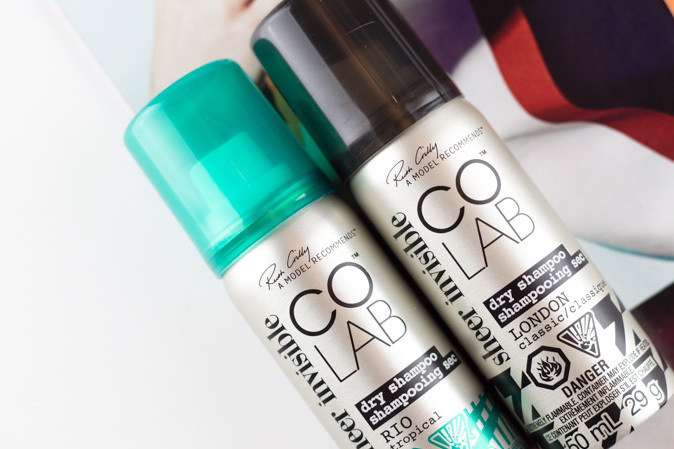 COLAB Dry Shampoo is a new dry shampoo created by Ruth Crilly, a model whom many of you may know as A Model Recommends. I personally, have heard of her blog/website and have visited it a few times, but had no idea she was so influential in the beauty world. What is so special about this dry shampoo? 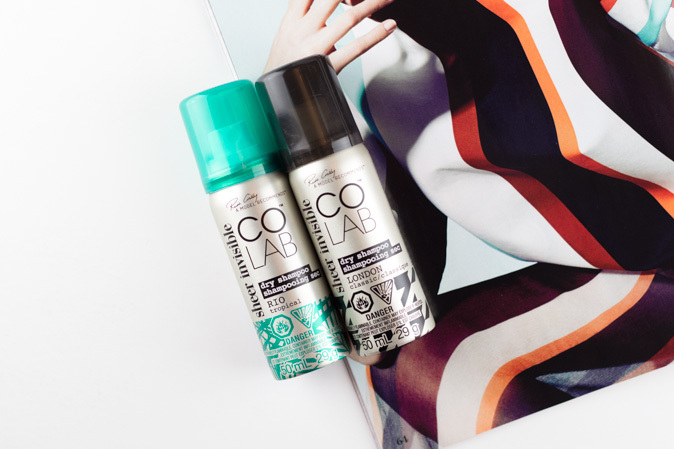 you may ask (I'm asking as well).. Colab Dry Shampoo is said to have a revolutionary (I know you've heard that word before) sheer & invisible formula, available in exquisite fragrances. It is said you will have no fear of white residue, and longer clean hair. The directions are pretty basic, they are not on the can but I have them here on a sheet of paper!.. Basically shake the bottle, spray focusing on the roots, massage into the hair after a few minutes, and brush hair if desired. I put the new dry shampoo to the test on 2nd (or 3rd) day hair. I literally just got my wisdom teeth out and am still swollen during this photo, so I can't really remember clearly hah. So my initial thoughts were that they weren't lying about the awesome fragrance. These dry shampoos have the best scents I've ever smelt from a dry shampoo and is almost like you're wearing perfume. But upon spraying, I sprayed a TON and did not end up achieving the affect I desired. The formula is semi-wet and you do need to wait a minute or so for it to dry before trying to rub it in. I did notice a light powder when spraying the London and was like "yeah! That's what I wanna see". London has a few more ingredients than Rio and strangely, I felt like London was a bit more effective but I could just be hallucinating. Ingredients of London: Butane, Isobutane, Propane, Alcohol Denat, Aluminum Starch Octenylsuccinate, Parfum, Citronellol, Limonene, Geraniol, Hexyl Cinnamal, Hydroxycitronellal. Ingredients of Rio: Butane, Isobutane, Propane, Alcohol Denat, Aluminum Starch Octenylsuccinate, Parfum. My hair doesn't feel weighed down, sticky, and overall I think it felt decently clean. However, I just didn't think the results were significant enough to purchase the full size. Definitely great for a refresher because of the awesome scents, however, I don't think I'd purchase this again and still prefer my Batiste over Colab. There are other, cheaper, drugstore options that I feel work similar to the Colab. 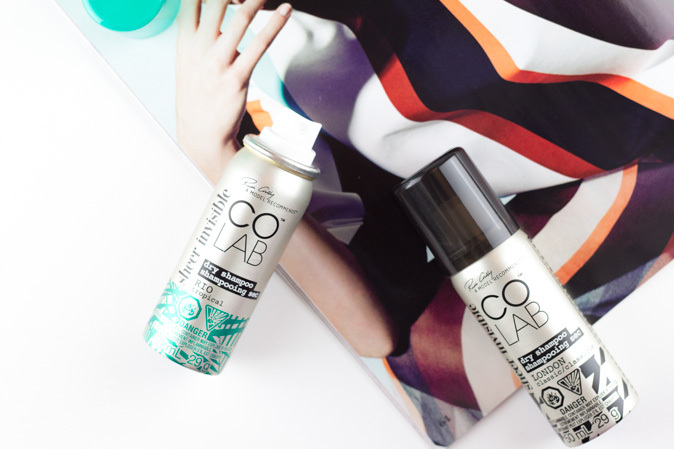 Colab Dry Shampoo is $5.49 CAD for the 50ml and $9.99 for the 200ml. I believe only the Rio and London versions are available here. It is available in Canada at London Drugs, Jean Coutu, Lawtons, select Pharmasave, PharmaChoice. To find these outside of Canada check out the info on their website here.